Google is helping to raise cash to restore a derelict building at Bletchley Park. 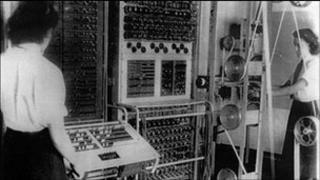 During World War II, Bletchley code-breakers gleaned information from German communications that proved vital to the Allied victory. The building, known as Block C, held the punch card index that acted as a "search engine" at the heart of decryption work. In 2010, Google helped return papers of cryptanalyst Alan Turing to Bletchley. Bletchley Park, which now houses the National Museum of Computing, is also widely recognised as having a pivotal role in the computer industry because machines built to help crack codes laid the foundation for more modern devices. Block C was built of brick and had an internal steel frame and a reinforced concrete roof to protect the punched cards stored inside. Last used in 1984, the building is now derelict. Efforts to raise cash to fund the restoration began with a garden party held at Bletchley on 4 August. The event raised about £10,000. Once restored, Block C will serve as a visitor and learning centre for both Bletchley Park and the National Museum of Computing. Efforts to save and restore Bletchley have been ongoing for some years. In October 2009, it received £500,000 from the Heritage Lottery Fund to begin restoration work. In March 2010 it won a government grant of £250,000 for critical repairs. Many others, both individuals and businesses, are helping it build up a fund of about £10m to restore the entire site.